Two long-range rockets fired from northern Gaza landed in Beersheba Wednesday morning. No injuries or damage were reported, but eight people were treated for shock. Residents were instructed to remain in secure spaces. One rocket landed in a schoolhouse located in a residential area. The school was empty at the time of the attack. Severe damage was caused to the structure. The second rocket exploded in an open area in the northern part of the Negev city. The Home Front Command reported that the siren did not sound prior to the landing of the first rocket at around 8 am due to a technical glitch. Shortly afterwards the alarm sounded, followed by the blasts of a number of rockets. At around 9:40 am a rocket fired from Gaza landed in Ofakim, located almost 30 kilometers from Gaza. There were no initial reports of injury or damage. Just 10 minutes later two rockets fired from Gaza landed in Ashkelon, lightly injuring two people. Another rocket landed outside the city. A number of people were treated for shock. Several more rockets were fired at the southern city throughout the day. In all, five of the city's residents sustained light shrapnel injuries and a number of others were treated for shock. President Shimon Peres was touring the city while it came under attack. His visit was cut short due to security considerations. During his visit to the Barzilai Medical Center in the city the president said, "Israel will not agree to exist beside a 'terror strip', and this is why Hamas is feeling the force of Israel's response. "We wanted to do it in a civilized manner (end rocket fire), but we have to protect our children," he said. "Hamas left us no choice." Rockets also landed in open areas near Kiryat Gat, Kiryat Malachi and Ashdod. In addition to these attacks, dozens of Qassam rockets were fired toward different areas in the western Negev region Wednesday morning. There were no reports of injuries, but some damage was caused. The Salah al-Din Brigades, the Popular Resistance Committee's military wing, claimed responsibility for the rocket that was fired at the Shaar Hanegev Regional Council. In a barrage launched at around 3:20 pm, four Qassams fired landed in Eshkol Regional Council limits. No injuries or damage were reported. more than 50 rockets were fired toward Israel since the early morning hours; dozens of people were treated for shock. Tuesday saw several rockets land in Beersheba. 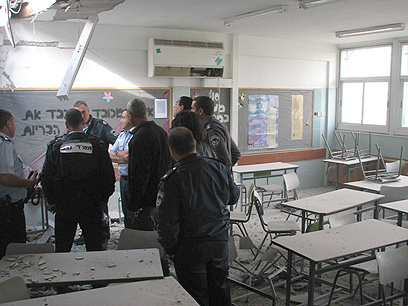 One rocket hit an empty kindergarten, causing damage to the building and to a nearby house. Dozens of people were treated for shock at Beersheba's Soroka Medical Center. Following the attack the Beersheba Municipality announced that the southern city's schools would not be opened Wednesday morning, including special education institutions. Itay Melamed, a resident of the city said, "The siren started wailing, I entered the bomb shelter with my family, and suddenly we heard a very loud explosion. I realized it was in front of the house, I took out the camera and took a picture of the smoke rising from the building that was hit. It's so surreal what's happening hear". Meanwhile, the Israel Air Force and Navy struck over 35 Hamas targets in the Gaza Strip overnight as operation Cast Lead entered its fifth day. The IDF Spokesperson's Unit reported the targets included Hamas Prime Minister Ismail Haniyeh's office and other Hamas infrastructures. On Tuesday some 40 Qassam and Grad rockets were fired toward Israel's western Negev communities. Two people sustained light shrapnel injuries and about 60 more were treated for shock. The Beersheba Municipality has instated a silent broadcasting radio station at 97FM, which will broadcast the city's air raid sirens and Home Front Command emergency instructions, in case of attack. 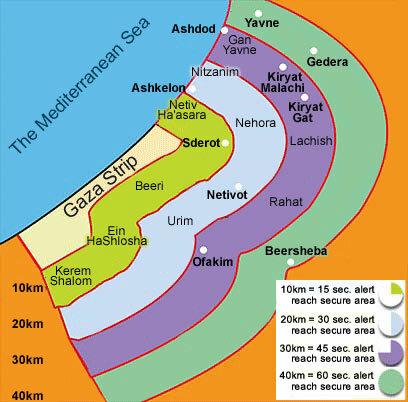 See all talkbacks "Rocket barrages hit Beersheba, Ashkelon; 5 lightly hurt"